Since 2002, it has been an option for vessels to be fitted with an Electronic Chart Display and Information System (ECDIS) along with a backup arrangement as a means of fulfilling the requirement under SOLAS regulation V/19-2.1.4 for the vessel to carry nautical charts for the intended voyage. This option was then changed during the IMO Maritime Safety Committee in May/June 2009, where further amendments to SOLAS regulation V/19 were made to make the carriage of ECDIS mandatory. The implementation was set up on a “roll-out” basis as shown below. As can be seen from the schedule, the next phase of the roll out is due to come into effect on 1 July 2015. 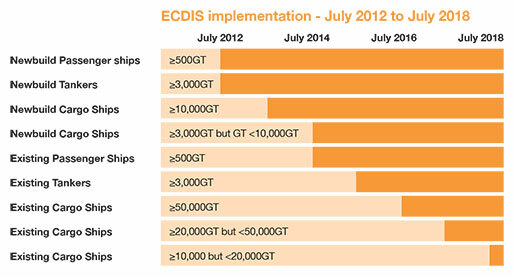 As a result, all existing tankers of 3,000 GT and upwards constructed before 1 July 2012 will require ECDIS to be fitted (comprising both a primary and backup system) not later than the first survey on or after 1 July 2015. In addition to this, companies must ensure that deck officers are trained in the use of the equipment, the changes in the provision of charts and chart corrections to the vessel from shore, and changes in the Safety Management System. In 2013, it was established that about 30% in tonnage of all maritime trade was conducted by tankers.1 This equates to about 8,500 ships. The majority of these ships in the global tanker fleet have yet to adopt ECDIS, according to data published by the United Kingdom Hydrographic Office (UKHO). To date, approximately 3,600 tankers (amounting to 42% of the global tanker fleet) use an Electronic Navigation Chart (ENC) service. This leaves almost 5,000 (58%) tankers that currently do not. Ensuring that a fleet is compliant can amount to a considerable undertaking, whether this involves the physical installation of ECDIS onboard, the delivery of type-specific training for crew or the necessary revisions to bridge policies and procedures. With only about six months to go until these amendments to the SOLAS Convention come into force for the global tanker fleet, owners and operators of tankers that are not yet ready to comply will wish to ensure they put in place well in advance of the deadline a thorough plan to adopt ECDIS. For more information, please contact Andrew Shannon, Master Mariner, on +65 6411 5352, or andrew.shannon@hfw.com, or your usual contact at HFW. Source Compiled by the UNCTAD secretariat, on the basis of data supplied by Clarkson Research Services and previous issues of the Review of Maritime Transport. This article examines the impact of the recent Ebola outbreak in West Africa and its effect on parties’ contractual obligations under time charterparties. Ebola is a viral disease which spreads through contact with bodily fluids, or via contaminated environments. A recent World Health Organisation report records more than 6,000 deaths in Guinea, Liberia and Sierra Leone. Masters may be reluctant to call at ports in Ebola-affected regions. Under a time charter, however, Owners must comply with Charterers’ employment orders and can only refuse to do so where compliance may expose the vessel or crew to danger. The evolving geographical spread of Ebola can make it difficult to evaluate any particular port’s safety at any one time. The question of safety, therefore, is largely one of fact and degree. Owners should consider the facts and their contractual rights carefully before deciding to deviate. An unjustified deviation would probably constitute a repudiatory breach following which the Charterer could terminate and claim damages (which may be substantial). A deviation may also prejudice a vessel’s P&I cover. Accordingly, it is recommended that Owners’ P&I Clubs are consulted before a deviation is contemplated. Owners may also have a contractual obligation to deliver cargo to third parties at a named discharge port recorded in a bill of lading. Failure to do so could result in cargo claims, and claims for losses arising in respect of deviation and transshipment. Whilst Charterer’s primary obligation is to pay hire throughout the charter term, the vessel may be off-hire in cases of quarantine, vessel detention, crew illness, port closures etc. For example, the “off-hire” clause in the NYPE 1946 provides that off-hire shall arise for loss of time resulting from “deficiency of men…preventing the full working of the vessel." Where there is no numerical deficiency, but a number of the crew are ill, it is doubtful that there would be a "deficiency of men" under the clause. Even if such illness constituted a "deficiency of men", this deficiency would still have to prevent the full working of the vessel for her to be offhire. A vessel may also be off-hire where the catch-all wording "any other cause" is qualified with the word "whatsoever", in which case “any other cause" could include the actions of the port authorities, e.g. in detaining the vessel. The off-hire provisions of Shelltime 4 may allow Charterers to place the vessel off hire if delay results from her quarantine. However, this will only apply where the delay arises from the master or crew communicating with the shore of the infected area without the prior written consent of the Charterer or Charterers’ agents. Owners should consider this when considering whether to allow crew shore leave involving disembarkation in Ebola-affected regions. If Charterers have not consented to this and the vessel is subsequently detained, the vessel may be off-hire. We recommend obtaining advice on the incorporation of bespoke Ebola clauses in charterparties to manage risk. Ebola clauses can clarify the parties’ obligations relating to time lost, costs arising from fumigation, quarantine, medical treatment (including deviation) and preventative measures. Ebola clauses can also make clear when a vessel is obliged to proceed to an Ebola-affected region and conversely, when the Charterers are obliged to nominate an alternative port. For more information, please contact Wole Olufunwa, Associate, on +65 6411 5344, or wole.olufunwa@hfw.com, or your usual contact at HFW. Researched by Joanne Button, Trainee Solicitor. After the collision off the French coast of the EL DELFIN and the ULTREIA, two sailboats flying the Luxembourg flag and the French flag, the ULTREIA interests commenced proceedings before the Civil Court of Dunkirk. The defendants (the EL DELFIN interests) challenged the jurisdiction of the Dunkirk Court arguing that the correct jurisdiction was Luxembourg. They did so by reference to Article 1(a) of the 1952 Brussels Collision Convention (the 1952 Convention), which provides that proceedings involving the collision of two (or more) vessels can only be brought in the courts of the place where the defendant has his habitual residence. The Dunkirk Court rejected the challenge to jurisdiction on the basis that the vessels collided in French territorial waters. The defendants appealed to the Court of Appeal of Douai which overturned the first ruling in a decision dated 6 December 2013, which found that the correct jurisdiction was Luxembourg. The ULTREIA underwriters then lodged an appeal before the French civil Supreme Court, the “Cour de cassation” which in its 16 September 2014 decision (ref. 13- 13.880) upheld the Court of Appeal judgment. The Cour de cassation ruled first that the 1952 Convention was the key authority, focussing on Article 8. The Court decided that whilst the collision had occurred in French territorial waters, it had not taken place in “inland waters” under Article 1(c), which the Court decided was a more limited area, reflecting the definition set out in UNCLOS III Article 8: “waters on the landward side of the baseline of the territorial sea form part of the internal waters of the State”. Second, the Court referred to Article 71§1 of the 2001 Council Regulation (No 44/2001 of 22 December 2000) concerning jurisdiction and the recognition and enforcement of judgments. This provides that where a specific convention exists it must prevail over European regulations. As a result of its interpretation of the relationship between the 1952 Convention and the Council Regulation, the Cour de cassation found that the 1952 Convention prevails over any other regulations or rules (whether EU rules or French domestic provisions). Consequently, the jurisdiction of the French courts was to be assessed against the criteria set forth under Article 1 of the 1952 Convention, which essentially provides that proceedings involving the collision of two (or more) vessels can only be brought before the Court of the place: (a) where the defendant has his habitual residence or place of business; or (b) where the defendant ship or another ship belonging to the defendant has been arrested, or security provided in response to a threatened arrest; or (c) of collision when the collision has occurred within the limits of a port or inland waters. The ULTREIA interests advanced a further argument before the Cour de cassation that Article 3§3 of the 1952 Convention specifically empowered the Dunkirk Court to retain its jurisdiction where proceedings had already been brought before it. Article 3§3 provides: “In the case of a collision or collisions in which two.... vessels are involved nothing in this Convention shall prevent any Court seized of an action by reason of the provisions of this Convention, from exercising jurisdiction under its national laws in further actions arising out of the same incident”. The Cour de cassation also rejected this argument, agreeing with the Court of Appeal that it was neither the intended purpose nor the effect of this provision to authorize a court to retain its jurisdiction, where, as here, none of the criteria in Article 1 of the 1952 Convention applied. The Court decided that “inland waters” in Article 1(c) should be defined as per the definition set out in UNCLOS III Article 8: “waters on the landward side of the baseline of the territorial sea form part of the internal waters of the State”. Such a definition is more limited than “territorial waters”. This landmark judgment confirms that whilst French courts ordinarily have jurisdiction regarding territorial waters, the 1952 Convention provides that the location of the incident is only capable of constituting a ground conferring jurisdiction in collision cases where the incident has occurred within inland waters as defined by UNCLOS III. It is also a clear illustration that international conventions take precedence over French domestic civil procedure rules. The interested insurers of EL DELFIN were represented by Stéphanie Schweitzer and Jean-Baptiste Charles of HFW’s Paris Office. jean-baptiste.charles@hfw.com, or your usual contact at HFW. While not a recent case the TUTOVA1 is a case that all P&I Clubs should keep in mind when issuing Letters of Undertaking and other Guarantees, particularly considering the current shipping market. The background to the case is relatively simple. The Cargo Interests (Almatrans) petitioned for the arrest of the TUTOVA in Italy for alleged losses that they suffered as a result of delay to a cargo. The P&I Club for the Owners, via their Italian lawyers, issued a Letter of Undertaking in Ravenna on 27 March 1993. On 15 September 1995, Almatrans sent a telex to the Owners claiming damages and threatening legal action. At about the same time the Cargo Interests sent a telex to the Owners’ Company Secretary and agents in the US. On 14 July 1997, Almatrans’ lawyers wrote again setting out the claim and making it clear that the letter interrupted the time-bar. Then on 31 July 1997, Almatrans issued proceedings against Owners in Italy and asked the court to serve process on Owners and on its Company Secretary in Cyprus. There were difficulties in carrying out service in Cyprus. On 27 May 1998, the P&I Club’s lawyers wrote to Almatrans’ lawyers requesting the return of the LOU as the limitation period had expired. Almatrans’ lawyers responded that the time bar had been interrupted by their letter of 14 July 1997. They did not mention that proceedings had been issued and served. After four hearings between 25 March 1999 and 6 July 2000 the Italian Court issued a judgment against the Owners. In February 2001, the judgment was filed in the Italian Court and steps were taken to serve the Owners in Cyprus. On 10 June 2002, Almatrans’ Italian lawyers wrote to the Club’s Italian lawyers enclosing a copy of the judgment and requesting payment by the Club. There were implied terms and/or conditions precedent to the LOU that Almatrans would give adequate notice to Owners of the start of proceedings or any application to court, and that any judgment obtained by Almatrans would be obtained properly and with adequate notice to the Club; the Club alleged that there had been sharp practice by Almatrans in deliberately failing to inform the Club of the existence of the proceedings. As a result of the sharp practice of Almatrans, namely Almatrans’ and/or its lawyers’ deliberate decision not to inform the Club or its lawyers of the Italian proceedings, it would be contrary to public policy to allow Almatrans to call on the LOU. The LOU was in conventional form and had been negotiated by lawyers to the parties who had the opportunity to consider carefully what the document should say. There was accordingly no justification, considering the wording of the LOU, to read into the LOU an implied obligation upon Almatrans to give notice to the P&I Club and/or their Italian lawyers of proceedings which Almatrans had brought against Owners. The allegation of sharp practice would be rejected. Had the litigation been conducted in London and an approach adopted similar to that used by Almatrans’ lawyers it would have been placed towards the bottom of the range of acceptable conduct. However, as the LOU was a common form of document used widely across the world often by those whose first language is not English the court had to be more cautious and had to take into consideration different legal systems and professional assumptions. In any event, in reviewing the case law2 there was no general principle that the law always provides a remedy where there had been sharp practice. Accordingly it was not contrary to public policy to allow Almatrans to enforce the judgment by calling on the LOU. As a result the judge found in favour of Almatrans. It is not difficult to think of further instances where the principles outlined in this judgment would be applicable. If for example a shipowning company registered in Liberia were wound up, then under Liberian law it would remain on the register for three years in order to prosecute or defend suits, notwithstanding that the company had been dissolved. This means that if a Club has provided a standard LOU on behalf of a Liberian registered Shipowner and that Shipowner is wound up, then that dissolution would not prevent a Claimant from progressing a claim against the Shipowner. As a result, as long as the Claimants have followed the necessary steps required by the relevant law and jurisdiction to contact the Shipowner they are entitled to progress the Court/arbitration to judgment/award and can then enforce against the LOU provided by the Club. Under the law as it now stands, the obligation to keep the Club informed of claims being progressed against a Member under a standard LOU therefore rests solely on that Member. As a result, if a Member is dissolved, it is important that the Club checks whether any LOUs or Guarantees have been issued and, if they have, then to contact opponents to ascertain the status of any proceedings. Better still would be for the Club to require, at the time any LOU were provided, the insertion of a clause requiring the Claimants to keep the Club informed of all existing or new proceedings undertaken against the Member relating to the liability that has been secured. For more information, please contact Edward Waite, Associate, on +44 (0)20 7264 8266, or edward.waite@hfw.com, or your usual contact at HFW. On 1 January 2015, following regulation 14 of the IMO’s MARPOL Annex VI, new regulations for vessels operating in Emissions Control Areas came into force. These regulations oblige vessels within these areas, currently the North Sea, Baltic Sea, North American coastline and US Caribbean, to burn bunkers with a maximum 0.1% sulphur content by mass. We have recently issued a Briefing concerning these changes, called Sulphur Emissions: A New Year’s Resolution, January 20151 (which can be found on our website). If you would like further information, then please contact Max Thompson, Associate, on +44 (0)20 7264 8230, or max.thompson@hfw.com, or your usual contact at HFW. Did clause in Club LOU replace the law/jurisdiction clause within the Bills of Lading? Incorporation of CP Law and jurisdiction clause into a Bill of Lading. Requirement to enter into “friendly discussions” prior to commencing arbitration is enforceable. Successful S68 Arbitration Act appeal for serious irregularity. Piracy/General Average – scope of allowable expenses widened. Arbitration Appeal – Award of interest under Late Payment of Commercial Debts (Interest) Act 1998 overturned. Enforcement of settlement agreement – meaning of Underwriters, award of damages, joint tortfeasor rule and specific performance. Title to sue under Cogsa 1992. STS transfer between VLCCS – consent “unreasonably withheld”. Gard’s claim against the IOPC Fund fails. Professional Negligence claim but useful comments on “as is where is” and the controversial UNION POWER case as well as the assessment of damages generally. Summary Judgment re container demurrage – is it a penalty clause? Discussion regarding incorporation of carriers tariff and an alleged failure to mitigate by the carrier. Enforcement strategies – appointment of a receiver by High Court in relation to overseas assets. For those interested in shipping and the environment we recommend subscribing to our Green Shipping Bulletin, which is released half yearly. This Bulletin provides in-depth coverage of green issues relevant to the shipping community. In our October 2015 Bulletin we dealt with such diverse topics as SOx emissions, ship recycling, a new maritime spatial planning directive and an update on the Polar Code. For more information please contact Max Thompson, Associate on +44 (0)20 7264 8230, or max.thompson@hfw.com or Jonathan Webb, Partner on +44 (0)20 7264 8549 or jonathan.webb@hfw.com. The next Green Shipping Bulletin is due to be released in April 2015. In December 2014, Lloyd's List published the fifth annual report of the Top 100 Most Influential People in Shipping and we are delighted that two HFW partners have again been recognised in the Top 10 lawyers list. Senior Partner Richard Crump, included in the list for the second year, is cited as having “surprised the industry” with his relocation to Singapore, but it is a move that has been recognised as underlining the firm’s commitment to the continuing growth of the maritime sector in Asia. Meanwhile, Partner James Gosling is listed for the fourth year running in relation to his recognised position as an expert in handling maritime piracy incidents and, more recently, advising on the impact on the payment of ransoms of recent changes to UK terrorism legislation. We are hosting a table at this annual dinner. Partners Paul Dean, George Eddings, Elinor Dautlich, Hugh Livingstone, Jonathan Webb, Craig Neame and Julian Pierce will be in attendance. James Mackay and Nick Roberson will be leading this two day training course. We are platinum sponsors and Konstantinos Adamantopoulos and Anthony Woolich will be presenting during the main conference on EU shipping competitiveness. We will also be hosting our own event at our Brussels office amid the conference, focusing on key EU regulatory issues for shipping. If you have not received this informative Bulletin, but wish to receive it in future, then please contact your normal HFW contact or, David Morriss on +44 (0)20 7264 8142, or at david.morriss@hfw.com or Nick Roberson on +44 (0)20 7264 8507, or at nick.roberson@hfw.com.